This article is about the Spanish city. For other uses, see Murcia (disambiguation). Murcia was founded by the emir of Cordoba Abd ar-Rahman II in 825 with the name Mursiyah مرسية and nowadays is mainly a services city and a university town. Highlights for visitors include the Cathedral of Murcia and a number of baroque buildings, renowned local cuisine, Holy Week procession works of art by the famous Murcian sculptor Francisco Salzillo, and the Fiestas de Primavera (Spring Festival). The city, as the capital of the comarca Huerta de Murcia is called Europe's orchard due to its long agricultural tradition and its fruit, vegetable, and flower production and exports. Murcia is located near the center of a low-lying fertile plain known as the huerta (orchard or vineyard) of Murcia. The Segura River and its right-hand tributary, the Guadalentín, run through the area. The city has an elevation of 43 metres (141 ft) above sea level and covers approximately 882 square kilometres (341 sq mi). The best known and most dominant aspect of the municipal area's landscape is the orchard. In addition to the orchard and urban zones (Alfonso X, Gran Via, Jaime I, and others), the great expanse of the municipal area is made up of different landscapes: badlands, groves of Carrasco pine trees in the precoastal mountain ranges and, towards the south, a semi-steppe region. A large regional park, the Parque Regional de Carrascoy y el Valle, lies just to the south of the city. The Segura River crosses an alluvial plain (Vega Media del Segura), part of a Mediterranean pluvial system. The river crosses the city from west to east. Its volumetric flow is mostly small but the river is known to produce occasional flooding, like those that inundated the capital in 1946, 1948, 1973 or 1989. The Segura was recognized as one of the most polluted rivers in Europe. The Segura river's Valley is surrounded by two mountain ranges, the hills of Guadalupe, Espinardo, Cabezo de Torres, Esparragal and Monteagudo in the north and the Cordillera Sur in the south. 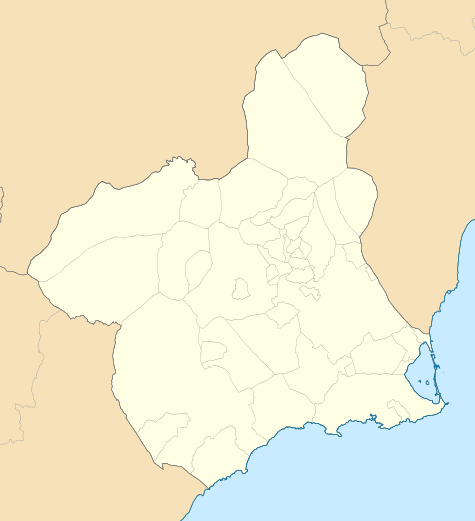 The municipality itself is divided into southern and northern zones by a series of mountain ranges, the aforementioned Cordillera Sur (Carrascoy, El Puerto, Villares, Columbares, Altaona, and Escalona). These two zones are known as Field of 'Murcia (in the south of Cordillera Sur) and Orchard of Murcia (the Segura Valley in the north of Cordillera Sur). Near the plain's center, the steep hill of Monteagudo protrudes dramatically. The 881.86-square-kilometre (340.49 sq mi) territory of Murcia's municipality is made up of 54 pedanías (suburban districts) and 28 barrios (city neighbourhood districts). The barrios make up the 12.86-square-kilometre (4.97 sq mi) the main urban portion of the city. The historic city center is approximately 3 square kilometres (1 sq mi) of the urbanized downtown portion of Murcia. Murcia has a hot semi-arid climate (Köppen climate classification: BSh), with arid climate (BWh) influences. Given its proximity to the Mediterranean Sea, it has mild winters and hot summers. It averages more than 320 days of sun per year. Occasionally, Murcia has heavy rains where the precipitation for the entire year will fall over the course of a few days. In the coldest month, January, the average temperature range is a high of 16.6 °C (62 °F) during the day and a low of 4.7 °C (40 °F) at night. In the warmest month, August, the range goes from 34.2 °C (94 °F) during the day to 20.9 °C (70 °F) at night. Temperatures almost always reach or exceed 40 °C (104 °F) on at least one or two days per year. In fact, Murcia holds temperature records close to the highest recorded in southern Europe since reliable meteorological records commenced in 1950. The official record for Murcia stands at a stifling 47.2 °C (117.0 °F), at Alcantarilla airport in the western suburbs on July 4, 1994 with 45.7 °C (114.3 °F) being recorded at a station near the city centre on the same day. 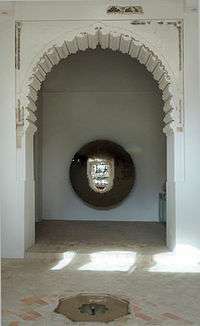 Muslim architecture of the Alcázar Seguir in Santa Clara Museum inside of Monasterio de Santa Clara la Real. Entrance of James I of Aragon at Murcia in 1266. The city in its present location was founded with the name Madinat Mursiyah (city of Murcia) in AD 825 by Abd ar-Rahman II, who was then the emir of Córdoba. Muslim planners, taking advantage of the course of the river Segura, created a complex network of irrigation channels that made the town's agricultural existence prosperous. In the 12th century the traveler and writer Muhammad al-Idrisi described the city of Murcia as populous and strongly fortified. After the fall of the Caliphate of Cordoba in 1031, Murcia passed under the successive rules of the powers seated variously at Almería, Toledo and Seville. After the fall of Almoravide empire, Muhammad Ibn Mardanis made Murcia the capital of an independent kingdom. At this time, Murcia was a very prosperous city, famous for its ceramics, exported to Italian towns, as well as for silk and paper industries, the first in Europe. The coinage of Murcia was considered as model in all the continent. The mystic Ibn Arabi (1165–1240) and the poet Ibn al-Jinan (d.1214) were born in Murcia during this period. In 1172 Murcia was conquered by the north African based Almohades, the last Muslim empire to rule southern Spain, and as the forces of the Christian Reconquista gained the upper hand, was the capital of a small Muslim emirate from 1223 to 1243. By the treaty of Alcaraz, in 1243, the Christian king Ferdinand III of Castile made Murcia a protectorate, getting access to the Mediterranean sea while Murcia was protected against Granada and Aragon. The Christian population of the town became the majority as immigrants poured in from almost all parts of the Iberian Peninsula. Christian immigration was encouraged with the goal of establishing a loyal Christian base. These measures led to the Muslim population revolt in 1264, which was quelled by James I of Aragon in 1266, bringing Aragonese and Catalonian immigrants with him. After this, during the reign of Alfonso X of Castile, Murcia was one of his capitals with Toledo and Seville. The Murcian duality: Catalonian population in a Castillian territory, brought the subsequent conquest of the city by James II of Aragon in 1296. 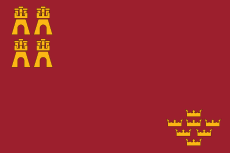 In 1304, Murcia was finally incorporated into Castile under the Treaty of Torrellas. Murcia's prosperity declined as the Mediterranean lost trade to the ocean routes and from the wars between the Christians and the Ottoman Empire. The old prosperity of Murcia became crises during 14th century because of its border location with the neighbouring Muslim kingdom of Granada, but flourished after its conquest in 1492 and again in the 18th century, benefiting greatly from a boom in the silk industry. Most of the modern city's landmark churches, monuments and old architecture date from this period. In this century, Murcia lived an important role in Bourbon victory in the War of the Spanish Succession, thanks to the Cardinal Belluga. In 1810, Murcia was looted by Napoleonic troops; it then suffered a major earthquake in 1829. According to contemporaneous accounts, an estimated 6,000 people died from the disaster's effects across the province. Plague and cholera followed. The town and surrounding area suffered badly from floods in 1651, 1879, and 1907, though the construction of a levee helped to stave off the repeated floods from the Segura. A popular pedestrian walkway, the Malecon, runs along the top of the levee. Murcia has been the capital of the province of Murcia since 1833 and, with its creation by the central government in 1982, capital of the autonomous community (which includes only the city and the province). Since then, it has become the seventh most populated municipality in Spain, and a thriving services city. On May 11, 2011, the city of Lorca and surrounding area was struck by a 5.3 magnitude earthquake. At least 4 people were reported to have died as a result of the earthquake. 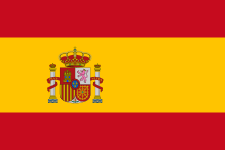 Murcia has 433,850 inhabitants (INE 2008) making it the seventh-largest Spanish municipality by population. When adding in the municipalities of Alcantarilla, Alguazas, Beniel, Molina de Segura, Santomera, and Las Torres de Cotillas, the metropolitan area has 564,036 inhabitants making it the twelfth most populous metropolitan area in Spain. Nevertheless, due to Murcia's large municipal territory, its population density (472 hab./km², 760 hab./sq.mi.) does not likewise rank among Spain's highest. According to the official population data of the INE, 10% of the population of the municipality reported belonging to a foreign nationality as of 2005. The majority of the population identify as Christian. There is also a sizeable Muslim population as well as a growing Jewish community. The Cathedral of Murcia was built between 1394 and 1465 in the Castilian Gothic style. Its tower was completed in 1792 and shows a blend of architectural styles. The first two stories were built in the Renaissance style (1521–1546), while the third is Baroque. The bell pavilion exhibits both Rococo and Neoclassical influences. The main façade (1736–1754) is considered a masterpiece of the Spanish Baroque style. Other noteworthy buildings in the square shared by the Cathedral (Plaza Cardinal Belluga) are the colorful Bishop's Palace (18th century) and a controversial extension to the town hall by Rafael Moneo (built in 1999). The Glorieta, which lies on the banks of the Segura River, has traditionally been the center of the town. It is a pleasant, landscaped city square that was constructed during the 18th century. The ayuntamiento (city hall) of Murcia is located in this square. Pedestrian areas cover most of the old town of the city, which is centered around Platería and Trapería Streets. Trapería goes from the Cathedral to the Plaza de Santo Domingo, formerly a bustling market square. Located in Trapería is the Casino, a social club erected in 1847, with a sumptuous interior that includes a Moorish-style patio inspired by the royal chambers of the Alhambra near Granada. 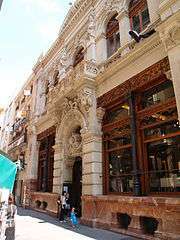 The name Plateria refers to plata (silver), as this street was the historical focus for the commerce of rare metals by Murcia's Jewish community. The other street, Traperia, refers to trapos, or cloths, as this was once the focus for the Jewish community's garment trade. 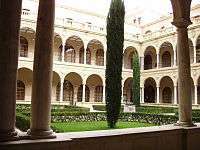 Santa Clara monastery, a Gothic and Baroque monument where is located a museum with the Moorish palace's remains from the 13th century, called Alcázar Seguir. The Malecón boulevard, a former retaining wall for the Río Segura's floods. Almudí Palace (17th century), a historic building with coats of arms on its façade. On its interior there are Tuscan columns, and since 1985 it hosts the city archives and usually houses exhibitions. San Juan de Dios church-museum, Baroque and Rococo circular church with the remains of the Moorish palace mosque from the 12th century in the basament, called Alcázar Nasir. In the metropolitan area are also the Azud de la Contraparada reservoir and the Noria de La Ñora water wheel. The Holy Week procession hosted by the city is among the most famous throughout Spain. This traditional festival portrays the events which lead up to and include the Crucifixion according to the New Testament. Life-sized, finely detailed sculptures by Francisco Salzillo (1707–1783) are removed from their museums and carried around the city in elegant processions amid flowers and, at night, candles, pausing at stations which are meant to re-enact the final moments before the crucifixion of Jesus. The most colorful festival in Murcia may come one week after Holy Week, when locals dress up in traditional huertano clothing to celebrate the Bando de la Huerta (Orchard parade) on Tuesday and fill the streets for The Burial of the Sardine in Murcia. parade the following Saturday. 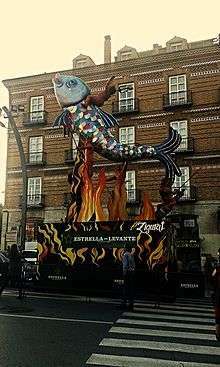 This whole week receives the name of Fiestas de Primavera (Spring Fest). Murcia's Three Cultures International Festival happens each May and was first organized with the intent of overcoming racism and xenophobia in the culture. The festival seeks to foster understanding and reconciliation between the three cultures that have cohabited the peninsula for centuries, if not millennia: Christians, Jews and Muslims. Each year, the festival celebrates these three cultures through music, exhibitions, symposiums and conferences. Economically, Murcia predominantly acts as a centre for agriculture and tourism. It is common to find Murcia's tomatoes and lettuce, and especially lemons and oranges, in European supermarkets. Murcia is a producer of wines, with about 40,000 hectares (100,000 acres) devoted to grape vineyards. Most of the vineyards are located in Ricote and Jumilla. Jumilla is a plateau where the vineyards are surrounded by mountains. Murcia has some industry, with foreign companies choosing it as a location for factories, such as Henry Milward & Sons (which manufactures surgical and knitting needles) and American firms like General Electric and Paramount Park Studios. During the 2000s, the economy of the region turned towards "residential tourism" in which people from northern European countries have a second home in the area. Europeans and Americans are able to learn Spanish in the academies in the town center. The economy of Murcia is supported by fairs and congresses, museums, theatres, cinema, music, aquariums, bullfighting, restaurants, hotels, camping, sports, foreign students, and tourism. Murcia-San Javier Airport (MJV) is located on the edge of the Mar Menor close to the town of San Javier, 45 kilometres (28 miles) southeast of Murcia. There is also an airport at the neighboring city of Alicante 70 km (43 miles) from Murcia. Furthermore, there is a new airport in development to be located in the town of Corvera, 23 km (14 miles). Bus service is provided by LatBus, which operates the interurban services. Urban bus services is offered by a new operator, TM(Transportes de Murcia), an UTE (Joint Venture) formed by Ruiz, Marín & Fernanbús. Tramways are managed by Tranvimur. As of 2007, 2 kilometres (1 mile) of line were available. Since 2011, one line is connecting the city center (Plaza Circular) with the University Campus and the Football Stadium. Train connections are provided by RENFE. Murcia has a railway station called Murcia del Carmen, located in the neighborhood of the same name. Several long-distance lines link the city with Madrid, through Albacete, as well as Valencia, and Cataluña up to Montpellier in France. Murcia is also the center of a local network. The line C-1 connects the city to Alicante, and the line C-2 connects Murcia to Alcantarilla, Lorca and Águilas. It also has two regional lines connecting it to Cartagena and Valencia. one public university: the University of Murcia, founded in 1272.
one private university: the Catholic University Saint Anthony, founded in 1996. There are several high schools, elementary schools, and professional schools. 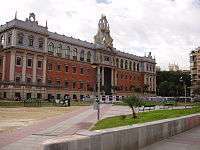 Murcia has three types of schools for children: private schools such as El Limonar International School, Murcia (an American international school) and King's College, Murcia (a British international school), semi-private schools (concertado), which are private schools that receive government funding and sometimes offer religious instruction, and public schools such as Colegio Publico (CP) San Pablo or the centenary CP Cierva Peñafiel, one of the oldest ones. The French international school, Lycée Français André Malraux de Murcie, is in nearby Molina de Segura. The private schools and concertados can be religious (Catholic mostly but any religion is acceptable) or secular, but the public schools are strictly secular. Concertado or semi-private or quasi-private schools fill a need by providing schools where the government isn't able to or predate the national school system. Instituto Licenciado Cascales is one of the oldest in the city, built in 1724, and perhaps the most emblematic. IES Alfonso X El Sabio is the only school in Murcia to offer the prestigious International High School Diploma. Murcia also offers Adult Education for people who want to return to complete high school and possibly continue on to the university. ↑ M. Kottek; J. Grieser; C. Beck; B. Rudolf; F. Rubel (2006). "World Map of the Köppen-Geiger climate classification updated". Meteorol. Z. 15: 259–263. doi:10.1127/0941-2948/2006/0130. Retrieved April 22, 2009. ↑ "Guía resumida del clima en España (1981–2010)". ↑ "Guía resumida del clima en España (1981-2010)". 1 2 "The Meccan Revelations". World Digital Library. 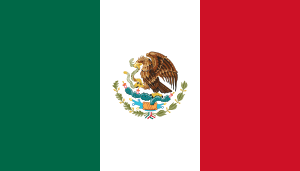 1900–1999. Retrieved 2013-07-14. ↑ "Murcia Three Cultures International Festival | Murcia, Spain". Whatsonwhen. Retrieved 2011-04-10. ↑ "Nous contacter." Lycée Français André Malraux de Murcie. Retrieved on 13 February 2016. "Adresse: Avenida del Golf, 107 Urbanización Altorreal Apartado de correos 133 30506 MOLINA DE SEGURA (Provincia de Murcia) ESPAGNE"
↑ "Miasta partnerskie - Urząd Miasta Łodzi [via WaybackMachine.com]". City of Łódź (in Polish). Archived from the original on 24 June 2013. Retrieved 2013-07-21. Wikimedia Commons has media related to Murcia. Wikivoyage has a travel guide for Murcia.